The Junco is based on an 8″ vintage Vifa M21WO-39-08 woofer. I bought this woofer the same time as my PL18WO-09-08, which is about 20 years ago. It stayed in storage all that time. In fact, I had plain forgotten about it. After working with the Vifa PL18WO, I went through my inventory for any 8″ woofers. True enough, I found a couple of M21WO-39-08. When I checked up on the frequency response, I was shocked to find it is exactly what I’m looking for. (20 Liters Bass Reflex, Baffle Width=10.5″) Fig 1 – Vifa M21WO-39-08 RAW Frequency Response. Mic on axis, Impulse Window 5ms, No smoothing. The plot in Fig 1 is the frequency response of the M21WO loaded in a 20 liters bass reflex. Baffle width is 10.5″. This response is very similar to what is published in Vifa’s datasheet. The M21WO extends high enough to cross to a tweeter and it does this without any nasty cone breakup. Equally important, it has a beautiful roll-off. Fig 2 – Vifa M21WO Frequency Response with Passive Crossover. Mic on axis. Impulse Window 5ms, No smoothing. Encouraged by the raw response of the M21WO, I proceeded to the crossover. The Blue plot in Fig 2 is with a 2nd order network. After some adjustments, I got a steep roll-off of about 25dB per octave. Apart from the steepness, the slope is almost a straight line. This will play a crucial role when it’s crossed with a tweeter. 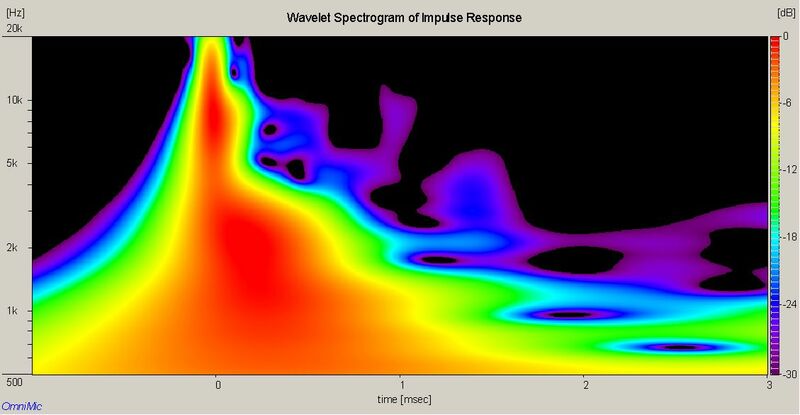 Fig 3 – Frequency Response of M21WO with HiVi TN28. Mic on TN28 axis. Impulse Window 5ms, No smoothing. I chose the HiVi TN28 (Fig 3, Red plot) because my current test box does not have enough space for a tweeter on the front panel. Moreover, the TN28 does not suffer from Baffle Diffraction like most dome tweeters. I figured if this combination works out, I will have no problem should I decide to upgrade the TN28 to the Morel CAT378 in future. Fig 4 – Summed Response of Vifa M21WO-39-08 with HiVi TN28. Mic on TN28 axis. Impulse Window 5ms, No smoothing. Fig 4 is the summed response of the Vifa M21WO with HiVi TN28. It is within +/- 5dB, which is quite acceptable. The M21WO and the TN28 integrated well as no cancellations are seen at the crossover region. Fig 5 is the Waterfall plot of the Junco (courtesy of REW). Time Range is 1.0ms, so this is a highly magnified view. There are a few artifacts above 10kHz which are inconsequential. However, some extended decay are seen from 2kHz ~ 9kHz. Junco Toneburst Energy Storage (TES) Fig 6 – Junco TES. Impulse Window = 5ms. Mic on TN28 axis. Fig 6 is another representation of the Waterfall. The Toneburst Energy Storage of Junco shows excess energy from 2kHz ~ 9kHz (the light Blue slices), consistent with the Waterfall plot. This is no cause for alarm. They are still very minor. The excess energy seen in Fig 6 is visible in the Spectrogram (Fig 7). We can see the response is slightly hotter (Red) from 2kHz ~ 3kHz. The tweeter artifacts are visible from 4kHz ~ 9kHz (the Blue and Violet). They are extremely minute, lasting only 1ms long and at -30dB. There’s no way the human ear can make them out. The Junco Harmonic Distortion (Fig 8) averages -55dB below the fundamental. There are no anomalies detected. The slight bump at 1.2kHz (Red plot) is from the M21WO woofer. It’s 2nd harmonics and only a few dB, nothing to worry about. I tried 2-ways with the HiVi M8a, Usher 8137A and the Peerless 830869. All failed miserably. With the HiViM8a and the Usher 8137A, I was forced to cross below 1kHz. The cone breakup was too much to bear above that. So, these two woofers are best suited for bass duty in 3-ways. The Peerless 830869 can be crossed at 2kHz. The problem is the speaker sounded very plain to the point of boring. It’s not to say the 830869 is useless. She’ll probably do well in a 3-way but certainly not in a 2-way with the crossover at 2kHz. The M21WO is the only woofer so far that is capable of crossing to a hifi tweeter without difficulty. I crossed the Junco at 2.5kHz and she sounds perfectly beautiful. I am confident that the Junco will sound even better with the Morel CAT378. Out of curiosity, I tested the Finch with the M21WO setup as a subwoofer, crossed at 125Hz. It brought the Finch to a whole new level. The bass came alive. It was loud enough, tight and dynamic. No bloom. This proves the M21WO will make an excellent 3-way. One of the biggest problems with 2-ways using larger cones is the loss in the midrange. Often, the vocals sound recessed. Some to the point of being muffled. I am pleased to say that the Junco does not suffer from this “Background Music Syndrome”. In fact she has the same sonic signature as all my other designs, a midrange that is clear and sharply focused. The difference with the Junco is she has more bass. Because of the bass extension, Eagles Hell Freezes Over. sounds wonderful through the Junco. I didn’t even need to use a subwoofer. Chris Spheeris – Eros is another album that benefited from the bass of the Junco. It’s a shame that this Vifa M21WO-39-08 is no longer in production. She is really a superb woofer.